We are very fortunate to have a chicken farm close to where we live. The chickens are free range and taste amazing. I have lived in Gordons Bay for a long time now, but only recently found out that I can purchase directly from Lazena Farm. Their chickens are available in our local Spar, but I am not sure how far their distribution is. The chickens are happy ones, and free from antibiotics and brine. If I call and place my order before midday, I can collect my freshly slaughtered chicken pieces on the way home the following day. They only accept cash but for the prices I am paying, it is well worth not earning air miles. I love that I can support local, and it means maintaining the ethos of my blog which is about regional and seasonal produce. As we are only a family of two I portion up what I have purchased. I order breasts, thighs, and quarters for our meals and I save the whole chickens for when we have guests and roast chicken is on the menu. I also make sure that I order chicken livers, as these make a quick supper for the nights I don’t feel like cooking, or they make the best ever chicken liver pâté. For this meal I used the Biryani blend I had made as I wanted to adapt a curry recipe that my friend Gill had sent me. The chicken is the star of this dish, just as it should be. do you buy locally farmed chickens? How lovely to be able to purchase locally like this Tandy. Glorious recipe too. Ooh, I’ve never used arrow root before. This dish looks great. Biryani Chicken sounds good, the perfect Friday night dinner! Here in London, I buy chicken from supermarkets, but in Italy we buy locally farmed chicken. The quality is amazing and you really taste the difference. I never tasted this chicken dish before but I must make it soon! It looks tasty! I only buy locally or grown a lot myself ( veggies ) . I also buy 2x/week organic meat, at our local bio-planet from Belgian raised & fed animals, that roam outside. and how lovely that you have such a great resource nearby, nothing best happy chooks ! Your Biryani looks so perfectly spiced and seasoned!!! 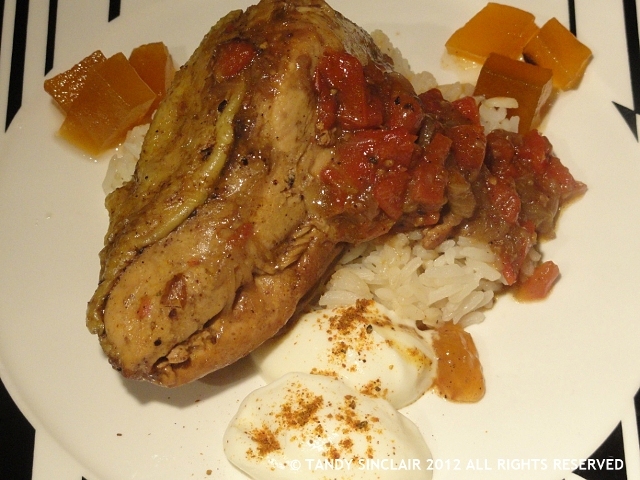 Tandy this chicken dish looks delish! Perfect for our Fall weather here in the states. Biryani is one of my favorite comfort foods! What a great recipe! Oh I wish my local Spar sold free range chicken! You are very lucky to have such great produce on your doorstep. I generally end up buying my meat from Woolworths as they are the only shop near me that has a good range of clearly labelled free range products. I’m interested in knowing the combination of spices you use in your Biryani blend.